Those of you who have been skiing before will realise that it’s a very energetic sport and you’ll start to use muscles you forgot you had. It’s important to make sure your body is in good condition, being fit will help to prevent injury. Be sure to stay hydrated and drink a minimum of 4 litres of water a day, you’ll become dehydrated faster on ski holidays as you’re often at very high altitudes where the air pressure and density is far lower than your body is used to. 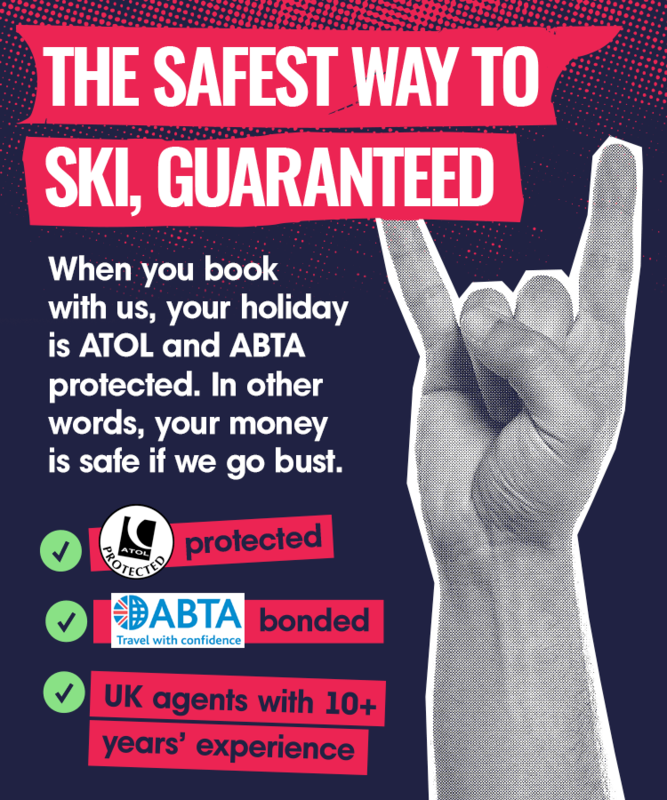 Before heading on your ski holiday, take out fully comprehensive winter sports insurance to keep yourself covered. Make sure it covers off piste skiing as many won’t offer this unless you’re skiing with a qualified guide. Heli-skiing isn’t always covered either so be sure to read the small print. It’s essential to carry a valid European Health Insurance Card (EHIC) with you if you’re travelling in Europe as this might allow you to receive free medical treatment or at least a reduction in costs if you become ill or have an accident. This isn’t a substitute for your travel insurance; you’ll still need that to cover other charges such as liability, delay and baggage. If you decide to drink alcohol whilst skiing and end up having an accident, your insurance could be invalidated. Alcohol will affect your judgement, co-ordination and reaction times so we definitely would not recommend consuming any whilst skiing. Although wearing a helmet when skiing is a personal choice, we really recommend it to keep you safe. Many resorts have made it a legal requirement for children to wear them. At higher altitudes the sun is much stronger and you need to ensure you’re applying sun protection to your skin. Goggles and glasses will protect your eyes from the glare of the sun of the snow and offer UV protection so it’s essential to wear them. European resorts offer enough choice for skiers of a variety of levels of ability – there’s such to be a resort perfect to keep everyone in your party entertained. You need to ensure you know how the pistes are classified in your resort – these will be indicated through a colour scheme. Black slopes are for expert skiers. To make sure you don’t get into difficulties and have to go off piste unnecessarily, be sure to always plan your route back to the village. It’s becoming more popular to go off piste – skiers seek the thrill of skiing on unmarked runs and experiencing the feeling of fresh powder snow. Off piste skiing can be a challenge, you should always make sure you’re with a professional guide who knows the area and can take you to the safe spots. If you do decide to go it alone, make sure you check your insurance policy. This may not cover you for off piste skiing. You’ll need to have with you a shovel, a probe pole, a flotation device, fully-charged mobile phone and an avalanche transceiver. Gather enough information about the area so you know where you are at all times and ensure you know the fastest route back to patrolled areas. Be aware of potential risks such as ravines, crevasses, cliffs, rocks and avalanches. Respect – do not endanger others. Control – adapt the manner and speed of your skiing to your ability and the general conditions on the mountain. Choice of route – the skier/snowboarder in front has priority, always leave enough space to pass safely. Overtaking – this can be dangerous, always slow down and allow plenty of space. Entering and starting – look up and down the mountain each time before starting or entering a marked run. Stopping – only stop at the edge of the run or somewhere you can be easily seen. Climbing – when climbing up and down, stay to the edge of the piste. Signs – obey all signs and markings, they’re there for your safety. Assistance – in case of accidents, please provide help where possible and alert the rescue services. Identification – anyone who is involved in an accident, whether witness or injured should exchange addresses and phone numbers for insurance purposes. If there has been an accident, the best thing to do is to ask someone further up piste to warn others. A good idea is to put up a snowboard or cross poles so that other skiers can clearly see you. You can provide basic first aid (if qualified) and warmth to the injured. Alert the rescue teams – tell them how many people are involved and the type of injury so they can send the correct people and equipment. Give them the place of the accident, piste name and nearest piste marker. Take the names and addresses of all people involved in the accident and of those who witnessed it too. Note down the time and circumstances in case police and insurance companies become involved.